Soft subtitles are text files that live outside of the video file, but can be toggled on or off in the video player. They are created by subtitling software and exported in different text formats - .srt, .sub, .ssa, or .vtt. Currently, Vimeo OTT only accepts .srt and .vtt files to be played in the streaming player with your movie. This .srt or .vtt file will also be available for download by the customer on the watch page. 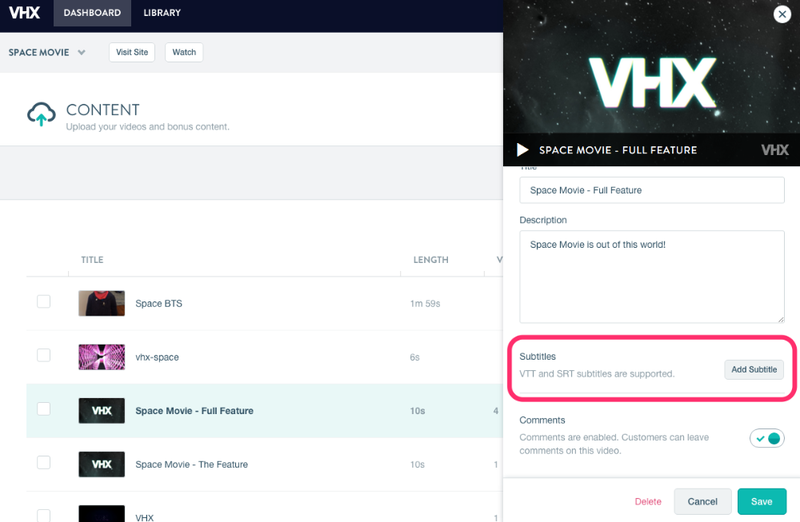 To upload your subtitle files (soft) to your Vimeo OTT admin, you can do so on the video's edit page. TIMECODE: MUST be in SRT format, like this: 00:00:07,751. Notice that it starts with "00". Other formats sometimes start with "01". This "01" will offset your timecode for SRT by 1 hour in our video player. You can use Jubler to fix this 01 issue by shifting the time. The subtitles need to reference the Media timecode and NOT the SMPTE timecode. ENCODING: Make sure the SRT is in UTF-8 format. That works best when displaying foreign characters. TIMECODE: WebVTT format only, like this: 00:01.000. Head to the edit page of the video. Click the Create Subtitle button. Upload the .srt or .vtt file from your computer. It will then be available to play in the streaming video player and for download on your site's watch page. Annotation Edit - Import your master video, create the subtitles at the appropriate times, and export. You can output to a video file or make SRT files. James and Lisanne of Indie Game: The Movie claim this program is much easier for subtitle creation than a traditional video editor like Final Cut Pro. Final Cut Pro - Edit your subtitles right onto your film and export for hard subtitles. Adobe Premiere - Same idea as in Final Cut Pro. Edit right onto your video for hard subtitles. Jubler - A wonderfully free and easy tool to create and edit subtitle text files of all types. FinalSub - Works hand in hand with Final Cut Pro to create subtitles. Inqscribe - A nice little Mac & Windows app that helps you transcribe when creating subtitles. Kolibri - Does both hard and soft subtitle management with an easy to use interface. Aegisub - Aegisub makes it quick and easy to time subtitles to audio, and features many powerful tools for styling them, including a built-in real-time video preview. Dotsub - Dotsub is a browser-based, one-stop, self-contained system for creating and viewing subtitles for videos in multiple languages across all platforms, including web-based, mobile devices, and transcription and video editing systems. Subs and Caps - Subs and Caps will find you the best company for your subtitling or closed captioning project. You can then compare pricing and services and reserve your project. Sub-sub.com - They'll make your subtitles for you! Have more recommendations or other tips? Let us know!